To Canberra at Christmas with my sister (from afar) to see my father and stepmother. 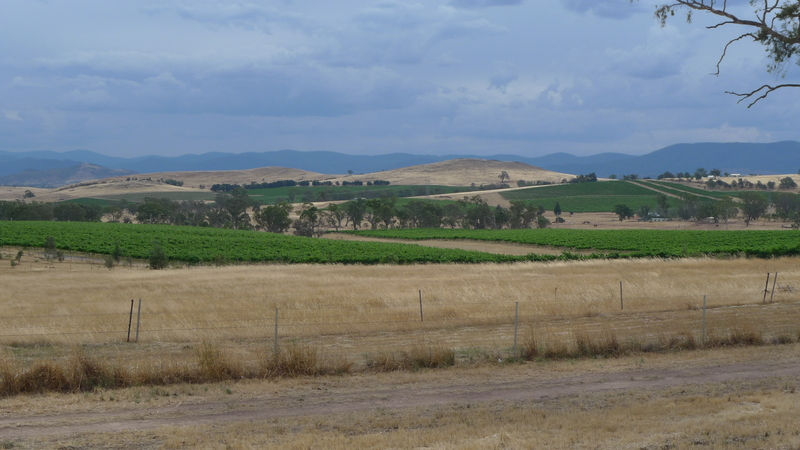 This is the former Hardy’s vineyard, with the Brindabellas in the distance, from just near their place. The 2000 Olympics in Sydney were a big thing for the Sydney Korean community. For the first time, the two Koreas, whilst still at war, were to take part together as a single team under a neutral “Korean peninsula” flag. Funds were raised and efforts mounted to provide the visiting athletes with local support worthy of this occasion. Mr Cha was a leading figure in the Korean and more specifically the Korean sporting community. He became chairman of the support committee. After the games were over, accusations were made concerning Mr Cha’s management of the committee’s funds. A so-called audit (not actually by auditors) was undertaken and its results, highly critical of Mr Cha, were published in practically every local Korean newspaper (there are a number of these). Mr Cha sued for defamation. He commenced the proceedings in June 2002. Judge Judith Gibson handed down her judgment this month (December 2009), and also published a number of interlocutory judgments. She found for the plaintiff and awarded a total of $240,000 damages against the various defendants. There will also be interest (generally this is from the date of publication), which is a matter still to be argued about. However both of these amounts are likely to be dwarfed by the costs of the hearings, which stretched out over years and a total of 82 days, so far. Here are some extracts from two of the judgments. They are lengthy (though not in comparison to, in particular, the principal judgment). I’ve offered the minimum of commentary. For litigation tragics (and I only expect litigation tragics to get through them) I hope they speak for themselves. From Cha v Oh (No. 21)  NSWDC 130, in which Gibson DCJ refused leave to the plaintiff’s solicitor to file a notice of ceasing to act. It was intimated that Mr Evatt, counsel for the plaintiff, might also withdraw from the case. 25. This brings me to the question of counsel. While courts may have an inherent jurisdiction to supervise the conduct of counsel (for example, the ability to intervene to have counsel removed: Kallinicos v Hunt (2005) 64 NSWLR 561;  NSWSC 1181 at ), I do not have the same degree of control over Mr Evatt as I do over the solicitors on the record. I can only appeal to his better nature not to leave a junior member of the Bar, especially one to whom he is related, in circumstances which may expose her to any kind of unnecessary stress, complaint or other kinds of action. Ms Evans deserves better, in my view. The first defendant, Mr Oh, was the president of the Korean Journalists Association in Australia, according to a letter from the Association dated 30 September 2000 (Exhibit 56). He wrote the first, third, sixth, seventh, eighth, eleventh, twelfth and fourteenth matters complained of which went before the s 7A jury, which appeared in “Hojudonga”, a Korean language newspaper. His article of 22 December 2000 (the first matter complained of) summarises the interim audit results provided to the Australian Korean Journalists Association by the fourth and fifth defendants on 21 December. Mr Park, the fourth defendant, disputes this, and says that Mr Oh came to his desk and stole documents from him (Daily Transcript 2638, 30 March 2009, Day 59). The “interim audit results” Mr Oh wrote about were not produced at the trial, nor were they provided to the plaintiff or the cross-defendant in response to their requests at the time (Daily Transcript 1767, 30 May 2008, Day 45); Mr Park says this report was mislaid (Daily Transcript 2793-2795, 1 April 2009, Day 61). Mr Oh never contested these proceedings. After the s 7A jury found imputations were conveyed by each of these publications (a schedule is set out in Part 2 of this judgment), he failed to comply with peremptory orders to file a defence. Judgment was entered against him. He died after judgment was entered. Defamation actions do not survive death, so the action abates. This is an important exception to the general rule of survivorship of actions, and is one of the reasons why delay in defamation actions should be regarded with concern by the courts. The District Court roster requires accurate estimates of time from the parties before setting down all civil and criminal trials in this court. The Court of Appeal’s finding that these proceedings were adjourned in June 2007 so that the plaintiff could read some documents (Jae Kyung Lee v Bob Chae-Sang Cha  NSWCA 13 at ) is incorrect. The hearing time allocated for this trial was four weeks, but after this four-week period, the case had to be adjourned part-heard because the plaintiff’s cross-examination had still not concluded and the court calendar and lawyers’ commitments meant the hearing could not continue. I made orders for further particularisation of the defence of justification as this defence had clearly not been adequately particularised. Prior to the first adjournment, the parties gave the court an estimate of another four weeks to finish the matter. After four further weeks, the plaintiff’s cross-examination was still not completed. The hearing was adjourned to January 2008. In the final week of this second period of hearing time, an application was brought for me to disqualify myself. That judgment was appealed: Jae Kyung Lee v Bob Chae-Sang Cha  NSWCA 13. The January 2008 hearing had to be vacated pending the Court of Appeal’s decision, and the hearing could not resume until May 2008. This being the third time the trial was part-heard, I asked the parties to give an estimate of the hearing time in writing. For the third time, the hearing could not be completed in the time estimated by the parties. This time the parties had no further hearing dates available until 2009. Each time the case was adjourned, there were problems with document management and changes to the court roster. Managing this case has been a strain on court resources and staff, as the transcript will demonstrate. All parties are responsible for this. It has taken the parties eight months (15 April to 6 November 2009) to provide submissions. Neither Mr Wheelhouse SC nor Mr Evatt can use a computer. As the trial transcript grew longer and the adjournments more numerous, finding references in the paper transcript became, for them, a lengthy process. Disputes, usually on Browne v Dunn issues, arose. For the 2009 section of the trial, I installed computer screens on the bar table. This had limited success because, as Mr Wheelhouse SC explained, he was “the Prince of Luddites” and could only use the paper transcript (Daily Transcript 1711-1712, 29 May 2008, Day 44; Daily Transcript 2319, 23 March 2009, Day 55). Mr Evatt was no better (Daily Transcript 2243, 23 March 2009, Day 55; Daily Transcript 2559, 26 March 2009, Day 58; Daily Transcript 2669 and 2679-2680, 31 March 2009, Day 60). There were complaints on both sides about delay in the case, particularly concerning the length of the plaintiff’s cross-examination. Mr Wheelhouse SC said that any delay in the cross-examination was because the plaintiff “never answered any questions, ever” (Daily Transcript 862, 8 October 2007, Day 23). In response to inquiries about the length of the cross-examination, he said that interruptions by Mr Evatt and myself meant he was only able to ask the plaintiff “ten questions a day” (Daily Transcript 1221-1222, 16 October 2007, Day 28). At the end of the plaintiff’s long cross-examination, there were only a few days of the trial remaining in 2007, and Mr Evatt was anxious to call witnesses who had been waiting since May (notably the plaintiff’s accountant) to give evidence. The fourth defendant then told the court he wanted to cross-examine for five days, which meant the plaintiff could call no more witnesses. The fourth defendant had refused requests by both Mr Wheelhouse SC and myself to sit at the bar table for the duration of the case (Daily Transcript 123, 6 June 2007, Day 6; Daily Transcript 847, 5 October 2007, Day 22; Daily Transcript 1025, 10 October 2007, Day 25). Mr Wheelhouse SC had previously told me he would ask questions on the fourth defendant’s behalf (Daily Transcript 371, 14 June 2007, Day 11) and on occasions took objections on the fourth defendant’s behalf (Daily Transcript 67, 68 and 71, 4 June 2007, Day 4). In the course of dealing with this application, which I granted, I commented that the fourth defendant had refused to sit at the bar table as counsel as I had several times requested and had sat at the back of the court laughing, and that his defence needed to be amended as he had only pleaded a defence of justification to two imputations. I did, however, allow the fourth defendant to amend his defence and to cross-examine the plaintiff, which he did for the rest of the time allotted for the trial. The second and fourth defendant made an application for me to disqualify myself on the basis of both actual and apprehended bias for these remarks I made about the fourth defendant. I refused to do so. The matter was adjourned to the following year (29 January 2008), with the plaintiff still technically under cross-examination, as the fourth defendant clearly needed to consider his position concerning issues of malice and qualified privilege, which he had not dealt with, and with the plaintiff having been unable to call any of his witnesses. A Holding Summons was filed in the Court of Appeal, and an application for leave to appeal from my refusal to disqualify myself was brought in November 2007. This meant the hearing had to be adjourned. On 8 December 2007, at the request of the parties, I vacated the hearing date of 29 January 2008 and placed these proceedings in the Inactive List, pending the decision of the Court of Appeal. The Court of Appeal dismissed the appeal: Jae Kyung Lee v Bob Chae-Sang Cha & Ors  NSWCA 13. The hearing was given a fresh trial date commencing on 5 May 2008. When the hearing started, I was told the plaintiff was in financial difficulties and that his former lawyers were seeking to enforce judgments on legal costs in the Bankruptcy Court. His new lawyers sought a number of adjournments. Some evidence from reputation witnesses was taken. The seventh defendant’s cross-examination was commenced but had to be adjourned part-heard to March 2009 when an exhibit was found to be missing. The Civil Procedure Act is still something of a lex imperfecta, in that failure to comply is rarely penalised. The burden on court resources, as well as on parties, caused by repeatedly part-heard trials and prolix pleadings is significant. Judges in the District Court are not given secretarial assistance or time out of court to write judgments, even lengthy ones, and all judgments must be handed down within two months of judgment being reserved. While I can understand the reasons for this regime, having regard to the need for justice to be just, cheap and quick, it is difficult to achieve without assistance from computer-literate counsel who have considered the law, distilled the facts and issues and presented them in a clear and concise fashion in properly pleaded and particularised claims and defences. There were similar problems during the trial. One of the lawyers in this litigation took an exhibit from the exhibits desk in the court without notifying the court or returning it, with the result that the seventh defendant’s cross-examination had to be adjourned for six months. On another occasion earlier in the litigation, a solicitor who no longer acts for the plaintiff left the plaintiff’s box of cheque butts in Court 21A after the hearing was adjourned. Arguments broke out between the parties as to what had happened to them. Fortunately a court attendant located the relevant documents in a box under a chair, where they had escaped the attention of other persons attending official court functions and hearings between October 2007 and March 2008. Mistakes, errors and carelessness occur in long trials. As the plaintiff had clearly been cross-examined about matters that were not in the particulars, I ordered the second defendant to provide further particulars. These were in excess of 140 pages in length and when the matter resumed on 24 September, Mr Evatt brought an application to strike out the defence of justification on the basis that the particulars were so prolix and incomprehensible that they amount to an abuse (Daily Transcript 476, 24 September 2007, Day 17). My judgment on that application is set out in  NSWDC 300. With the benefit of hindsight, my decision was clearly wrong. “Q. Mr Cha, do you agree that if you fail to provide to the auditors any evidence to support the expenditure of $8,470 on a trip to Korea between 15 February and 21 March, it would be reasonable for the auditors to suspect that that claim was not a truthful claim. EVATT: I object to that, your Honour. EVATT: I mean, this is ridiculous. HER HONOUR: Well, it shouldn’t be on my bench. Can I hand it down, Mr Evatt. This looks like a document of yours. It’s a bundle of original documents including, I might add, a receipt. EVATT: I mean, he gave Mr Park and all the others the full details of it. He’d better have a look at it, your Honour. My friend knows it’s all false. HER HONOUR: I don’t know what it’s doing on my table. Somebody put that on my table. HER HONOUR: Well, you’re welcome to look at it. WHEELHOUSE: Can I have my question answered? EVATT: No. Look, it’s a disgrace. WHEELHOUSE: Could I have a look at it, then, your Honour. HER HONOUR: Yes. Well, Mr Evatt, you show them to Mr Wheelhouse. HER HONOUR: It’s because what troubles me is that it looks like there’s a statement from a witness of yours at the back who – about how it was an official trip. EVATT: That’s their witness, your Honour. They’ve hidden these documents from us. HER HONOUR: Somebody Choi. I’m not very good on names. EVATT: This has sneaked out by mistake. HER HONOUR: Well, somebody has put it on my bench by mistake. EVATT: They know full well there’s proper records of this. HER HONOUR: You can deal with that in reply, Mr Evatt. EVATT: That’s a matter I wanted to speak to you on about that. WHEELHOUSE: These are not our documents, your Honour. They’re from my friend’s brief. EVATT: Not from my brief. HER HONOUR: How did it end up on my bench? WHEELHOUSE: I’ve no idea, your Honour. They’re not documents I’ve had anything to do with. “Q. Mr Cha, I put to you that when you provided the expenditure resolutions to Mr Park and Mr Lee on 10 December 2000, you provided no documents to support the claim of $8,470.70 for your trip to Korea from 15 February until 21 March 2000. EVATT: How can my friend ask that when he’s got the documents in his hands? EVATT: Well, your Honour, I think it’s in fairness. HER HONOUR: Thank you, Mr Evatt. That’s enough. Yes, Mr Wheelhouse, just ask that question again. Q. My document says evidence required. A. I did. There are two staple holes. I must say they were attached with staples, and now there’s a blank paper. I’d like to know why there’s – this thing is out. A. That’s not true, it’s not possible. There’d be about four signatures on this resolution and why would have they signed that resolution if it was not right? Q. For whom did you buy presents in Korea? A. For example, I’ve given gifts to the Minister of Culture Promotion Department and Mr Kang Dae Wan, who was a member of Parliament who was also a member of the Veterans Association and Ms Chuk Jai Lee. She is from Korean Women’s University in Seoul. She looks after the Olympic acrobatics. Q. What is the document that you have to prove that? A. Because of those people that I just mentioned they gave $100,000 of donation that was from SK Securities. Q. They’re the SK Securities people you bought presents for? A. No, I didn’t know about SK Securities at the time. Q. Is this additional expenditure on SK Securities? A. What happened is the Koreans in Sydney, they were rather poor to give donations of large amounts. So I used my money and gave money to the committee as donations, and I didn’t have enough money, so eventually I went to Korea to ask for donations from people in Korean. Q. I put to you that ,in the absence of supporting documentation, the trip to Korea was for private business purposes and not for the committee. EVATT: I object to that, it’s two questions in one. HER HONOUR: I’ll allow it. Whether these documents were in fact the travel documents is unknown, as after they were given to Mr Wheelhouse SC by me, they were never heard of again. Both parties throughout the trial were careless with documents. I have only set out this transcript extract in full to indicate the kind of problems that occur in lengthy trials run in a disorganized fashion and because the plaintiff’s answers about this issue need to be read in context. (a) There is no proof of circulation for any Korean language newspapers. This is factually incorrect; the second defendant gave evidence that the circulation was about the same for each newspaper: Daily Transcript 2083 (12 June 2008, Day 51). In Marsden the matter was remitted for a retrial on damages, with the Court of Appeal recommending (Amalgamated Television Services Pty Ltd v Marsden (No 2) (2003) 57 NSWLR 338;  NSWCA 186 at ) that the trial judge for the assessment, either by the trial judge who had heard these very lengthy proceedings or another judge, depending on the listing problems in the court. It is likely a similar application would be made in this case if there is to be a retrial on damages. If appellate courts are of the view that my findings on quantum should be set aside, I respectfully invite them to consider the desirability of substituting their own findings on damages rather than remitting the matter to myself or (as the Court of Appeal suggested in Marsden) to another judge of this court. This was the course taken by the Full Court of the Supreme Court of South Australia in Cornwall & Ors v Rowan  SASC 384 at , where damages were reduced in relation to one of the imputations which the Full Court found was not conveyed. Many of the witnesses who gave evidence for the plaintiff were elderly and were having difficulty recalling the evidence when they were called, and their memory is unlikely to be better if there is a retrial in 2011 or 2012. Finality in litigation is an important issue for the parties and their witnesses, and probably also for members of the Korean community, such as the members of the Supporting Committee who worked so hard for the 2000 Sydney Olympics to be a success. With great respect to the appellate courts, a fresh trial could add years, as well as costs, to this trial, as would have been the case in Marsden. Part way through this trial, the plaintiff’s counsel’s request that I strike out the defendants’ particulars and defence of truth (see Cha v Oh (No. 10 & No. 11) (District Court of NSW, Gibson DCJ, 4 October 2007, unreported) in Cha v Oh (No. 22) (Part 2)  NSWDC 300). I dismissed that application and the resultant fairness of this trial will be a matter of concern for appellate courts, as I noted in my judgment at (Cha v Oh (No. 10 & No. 11) (District Court of NSW, 4 October 2007, unreported) at ). McClellan CJ at CL in Greig v WIN TV took from the jury a defence of justification which was adequately particularised before the trial but did not meet the evidentiary burden. The defence of justification in these proceedings, on my analysis of the evidence, similarly does not reach that standard of proof, and the circumstances in which it was provided late, and in vast quantities, led to procedural unfairness. My refusal to strike out the defence of justification in my decision of 4 October 2007 was wrong. As McClellan CJ at CL pointed out in his 4 November 2009 seminar paper on defamation law to members of the legal profession (“Eloquence and Reason – are juries appropriate for defamation trials?”) the “erosion of faith” in the common law adversary system that so concerned Sir Anthony Mason in 1999 is of particular concern in defamation trials because of the complexities of the law. This is particularly the case where the provision of vast quantities of material during the trial, coupled with pre-trial delays (however caused) also occur. The events in this case occurred between 1998 and 2001. Proceedings were commenced on 20 June 2002 and have taken until 12 November 2009 to complete. I am handing down my judgment as quickly as I can, as the interests of justice will not be served by more delay. These proceedings, like the Marsden litigation, demonstrate that delay can render any judicial determination pyrrhic, not simply for the parties, but for the common law system.. I have commented on this legal saga in the past (also a passing reference here). One thing which keeps the saga going is the enthusiasm and capacity of Mr Adamson, who is a solicitor, to keep prosecuting his claims and, in particular, contesting any adverse judgments by taking them on appeal. Recently the Court of Appeal has handed down two judgments on two such appeals. They are Adamson v Ede  NSWCA 379 and Adamson v Ede  NSWCA 403. The first of these rescues for posterity a matter which I was actually present in court for. Adamson was representing his company (in that case, acting as a solicitor) as well as acting for himself in person. The defendant was seeking to make a relatively last minute amendment of his defence at the commencement of the trial. The relevant question was therefore whether the amendment should be allowed or whether it was too prejudicial to Mr Adamson as a plaintiff at this stage in the proceedings. Mr Adamson could have attempted an argument about this, but he took a more tricky, rules-based approach. He claimed that he had not been served with the proposed amended defence. I remember this quite distinctly because he kept on harping on the question of whether he had been served (which is a conclusion of law) and ducking the question of whether it had in fact been provided to him. It turned out ultimately that he considered he had not been served the amended defence because at the time he received it (a good month earlier) the solicitor from whom it came had not yet served on him a “Notice of change of solicitor” which would have indicated that it was the solicitor on the record for the defendant in the proceedings. It’s the sort of point an auto-litigant might take but not one which is calculated to impress a judge, especially if made by a solicitor, and especially as Mr Bilinsky, Mr Ede’s new solicitor, had previously appeared opposite Mr Adamson at an interlocutory hearing. It’s not as if he was unaware that, formalities aside, Mr Bilinsky was acting for Mr Ede. ADAMSON: That is a different matter from me reading the documents. They came to me a day after they were supposed to and from a firm which I didn’t recognise as the solicitor on the record. Why should I have looked at the document until today? I didn’t even know they were the solicitor on the record until today. HIS HONOUR: There is no merit in anything you have said so far. I propose to allow the document to be filed. Firstly, notice of those was given and, on the evidence, served on 25 October, which is more than a month before the hearing commenced. Secondly, the matters alleged are basically legal matters, not factual matters. ADAMSON: I am not admitting service. “HIS HONOUR: You have had that affidavit, haven’t you? ADAMSON: I haven’t read any documents. HIS HONOUR: I said you have had it, have you not? ADAMSON: I haven’t been served with it. I don’t propose to give any evidence over the bar table. HIS HONOUR: Mr Adamson, I am asking you, have you had it? ADAMSON: Are you ordering me to reply? ADAMSON: You are ordering me to reply whether I have had it? HIS HONOUR: Yes, you are a solicitor. HIS HONOUR: The affidavit of 24 October. ADAMSON: It was handed to me and I handed it to Mr Maskell, my associate. I have not read the affidavit. “ADAMSON: … This is completely different from what was served on the 25th. There was a document there, although I didn’t read the document I know it was not in this form. HIS HONOUR: You can’t say that, you say you haven’t looked at it. ADAMSON: I said I glanced at it. I said I could see what it was and I answered your question. Is it alleged this is the same document that was supposedly served on the 25th? HIS HONOUR: I thought so. ADAMSON: I don’t think it is. Can the other side be asked that? 125 Confirmation was given that the proposed amended defence was identical with the one that had been delivered (to use a neutral word) on 25 October. It’s that bit where Adamson asked the judge whether he was ordering him to reply which I particularly like. It hardly seems the right way to start out before a judge who will be trying your case. You’re obese, you’re 70, and you’re a barrister! Overheard from the corridor on my way to my room today. Not, I think a direct declaration, but rather a recounting or more likely foreshadowing of a supposed killer point in cross examination. What obvious risk amongst many is the hapless chap (almost certainly a chap) charged with knowing? The sadder thing is that, providing I’m otherwise spared, it’s not difficult to foresee such a future for myself. It’s all a bit dispiriting, not to say an exhausting prospect. in Pinchgut‘s latest production of Cavalli’s L’Ormindo, which I went to tonight. The style of the opera takes a little getting used to. At first, the twists and turns of the plot limit the opportunities for building up any particularly sustained affect or mood, other than a tendency to rather cheerful triple time. It’s a comedy, after all. In the third act, as the various plot lines reach their respective resolutions, there is more of an opportunity for some longer musical paragraphs, which comes as a bit of a relief. And of course denouements are the more affecting moments. Or maybe I was just getting used to the style by then. The house didn’t seem to me to be as full as Pinchgut might have hoped: they sold most of the good seats but should probably have lowered the price on the cheap ones, at least for the first night on a Wednesday. Every year when I hear the orchestra at Pinchgut I remind myself of what early music bands in Sydney used to sound like. There’s a generation and more of tuition and development of skills now and you can really feel it. This is really just a provisional comment: were I a twitterer I would probably tweet. As hinted above, Kanen is a tremendous scene stealer. I was a bit surprised to read that Trevor Pichanek (Amida) has been in the AO chorus since 2007 because he didn’t really seem comfortable on stage. It was something to do with not wanting to let his elbows leave the side of the body, so that we had arm gestures from the elbows only. He’s meant to be a military hero but I can’t say he came across as one. Amongst the support characters, Anna Fraser made a particularly strong impression. Someone tweeted earlier that those baroque plots are often easier to follow on the stage than they are on the page, and I certainly found that to be the case. There are performances on Saturday, Sunday (early evening/late afternoon) and Monday. I’ll probably say more after I see it again on the last night. You are currently browsing the Stumbling on melons blog archives for December, 2009.